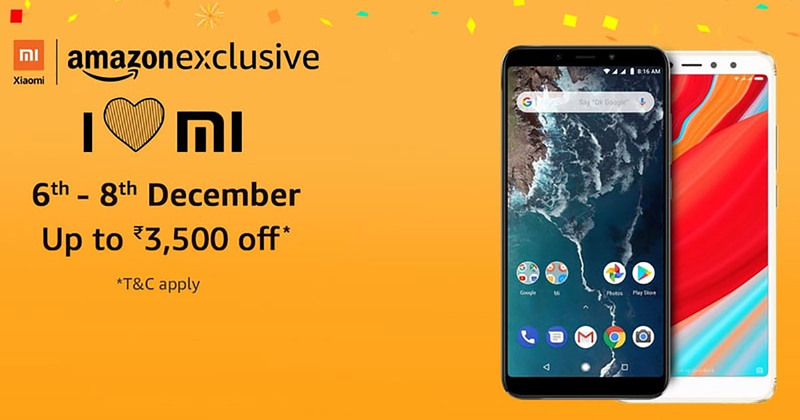 From December 6, 2018 to December 8, 2018, Xiaomi India will run a promotional sale on Amazon. On Amazon India, Xiaomi sale will be offering deals on smartphones. Xiaomi has already disclosed two offers while the third ‘special surprise’ will be disclosed on 6 December 2018. The ‘I love Mi’ sale will offer discounts on the Redmi Y2 and Xiaomi Mi A2. Rs 3,500 discount is offered on Mi A2 and Rs 2,000 discount on Redmi Y2 i.e. during the sale, the Redmi Y2 (3GB, 32GB) will be available at Rs. 8,999 (MRP Rs. 10,499) while the Redmi Y2 (4GB, 64GB) will be available at Rs. 10,999 (MRP Rs. 13,499). The Mi A2 (6GB, 64GB) will be available at Rs 14,999 (MRP Rs 17,499) while the Mi A2 (6GB, 128GB) will be available at Rs 16,999 (MRP Rs 20,500). Even Redmi 6A will also get discounted price in this sale. The Redmi 6A (2GB, 16GB) will be available at Rs 5,299 while the Redmi 6A (2GB, 32GB) will be available at Rs 6,999. Xiaomi will also disclose another deal on 6 Dec 2018 which will go live during its ‘I love Mi’ sale on Amazon which might be discounted on the Redmi 6A. Amazon India will also offer no-cost EMI and exchange discounts options on the Redmi Y2 and Mi A2. Along with Flipkart Big Shopping sale which will start from December 6, 2018, the Xiaomi’s ‘I love Mi’ sale will be running. Flipkart’s sale which is this week will offer the discount of Rs 5,000 on the Poco F1. apart from Flipkart and Amazon, the offer on Xiaomi’s smartphones will also be available on company’s own online store.